A Google Maps satellite view of Colbyville as it looks today. Duluth is full of neighborhoods with lost or nearly-lost names. As modern Duluthians become more mobile and have less connection to the place they live in, borders blend or move, and names disappear. Last year, a local article made mention of a man who reported he lived in Woodland, near the intersection of Snively Road and Woodland Avenue. According to city maps, this is actually Hunters Park. But should he ask any longtime neighbors, they’d surely tell him he lives in Glen Avon. It is but one example of the erasures that happen over time. Nancy Nelson’s feature last month on the Homecroft Movement mentioned one such “lost” neighborhood: Colbyville. Located between Jean Duluth Road and Hawk Ridge, Colbyville was centered in the rectangle completed by Amity Street, Colby Avenue and Carroll Street—and it is all that’s left of what was intended to be a small farmer’s paradise. Colbyville’s namesake was Joel Colby, a Mainer who saw rural Duluth as a fine place to settle in his later years, where he could both become a farmer and perhaps make a little lettuce in the real estate business. Joel Colby was born in 1822 in Massachusetts, but he really made his mark in Bingham, Maine, where the Joel Colby General Store was a central landmark. He married Elizabeth F. Parlin in 1856, and together they raised their four children and participated actively in local civic affairs. Lizzie became one of the first presidents of the Bingham library and was appointed a justice of the peace by the governor, while Joel got involved in local politics. I cannot see any good in a change of administration at this time, but fear much evil. I prefer that the party now in power should continue another four years at least. Many of my Democratic brethren here are feeling as I do, and I am very much mistaken if they do not with me vote for the conqueror of the Rebellion, this fall. Colby’s life in Bingham, however, was not all roses. His store went into bankruptcy in 1878. What he did in the ensuing ten years is a mystery, but in 1888 he showed up at least twice at the Bay View Hotel in Duluth, apparently scouting real estate opportunities. He was living in Duluth by 1894, the same year the Duluth News Tribune published a feature article on the movement toward local farming, “Be a Soil Tiller—Those Who Have Tried It Say It Pays.” The piece notes that Colby “went into the market gardening business some four years ago. His farm was originally a quarter section, but the sale of numerous blocks of five to 10 acres has contracted his homestead, while it has surrounded Mr. Colby with a little village of disciples and co-workers in this new industry. Mr. Colby himself is making a snug income from the two or three acres he plants in roots and garden produce.” The article emphasizes his success in the production of strawberries. Right from the beginning, Colbyville’s community center was the Colbyville School, a one-room schoolhouse educating 15-25 children at any given time. It had its own baseball team and hosted a community club, theater events, holiday programs and—on weekends—church groups. For a short time, before Sam Snively’s fame and large farm would prompt a name change, Snively Road was known as the Colbyville Road. 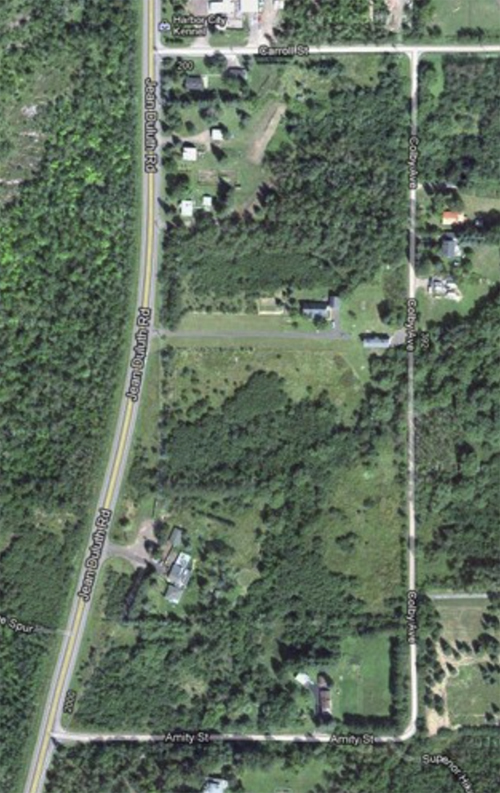 (Colbyville Road probably extended all the way along what became the Jean Duluth Road—which is also named for a farm.) After Joel Colby died in 1901, there was a brief effort to rename the neighborhood Riverside Park, but the movement failed. Colbyville was not only a farming district, but was also eastern Duluth’s playground. It was a popular sleigh ride destination and where the Duluth Snowshoe Club would go tramping to a shelter they called “Woods Cabin.” Hunters found both bear and deer there and at least twice hunting accidents terrified the neighborhood. In November of 1910, a group of neighborhood men walking to the streetcar on Woodland Avenue were reportedly attacked by a small pack of starving wolves, which they repelled with sticks and stones. Colbyville might have succeeded as a centerpiece for the Homecroft Movement; however, the neighborhood was plagued by regular assaults from forest fires. In late May of 1905, Colbyville residents fought a “desperate battle” to save their homes in the face of 200-foot-high flames, and it was only the luck of a wind change that saved the whole area from being “wiped off the face of the earth.” Two homes and the telephone poles connecting the neighborhood to the city were burned down. In 1910, two fires during the drought of May and subsequent heat wave of July also swept through, causing property damage and a severe loss of trees. The peril of fire was doubly frightening because city water did not then extend so far, and fire fighters had to rely on Amity Creek for a water source. The devastating Fire of 1918 might have been the final blow, but by that time Colbyville was a shell of its former self. After closing and opening again, Colbyville School was finally closed on order of Superintendent Denfeld in 1915, considered “unfit” for students, because it lacked modern heating, ventilation, and sanitation. Neighborhood parents fought the closure, insisting that the bus ride to Washburn School was too long and difficult during cold months, but the school building was up for sale by 1918. While Colbyville is no longer identified as a neighborhood on most maps, its name graces some nearby public land: Colbyville Forest Park.